Siphoning is one of the necessary evils for homebrewers. Unless you are fortunate enough to have a large RIMS/HERMS brewing system with wort pumps and conical fermenters, and pumps for transferring between fermenters, you have probably had to siphon your beer at some point. We siphon to move wort to the fermenter, we siphon to transfer beer to a secondary, we siphon finished beer to a bottling bucket or keg. This leaves the trub or sediment behind, but siphons can be a challenge to work with. The big risk here is oxygen – which is an enemy of finished beer. Oxygen in large quantities will rapidly spoil your beer, but even in smaller quantities it will destroy long term flavor stability and also contribute to chill haze and clarity problems. A siphon is an ancient device that uses gravity to transfer liquid from one vessel to another. As long as the liquid level in the destination is lower than the source, it will transfer the liquid until you run dry. The first challenge is that you have to “prime” the transfer tube with some water or wort in order to get the flow started. The second is that you need to prevent the siphon from getting plugged up with trub and sediment, which is an issue both after the boil and after fermentation. When I started brewing, most of use primed a siphon by filling the hose with some sterile water, and clamping or plugging one end. The clamp was then released once we had both ends positioned, and it would siphon away. The problem with this approach was the difficulty of filling the siphon without contaminating it, and keeping it full while positioning the two vessels. It was not an ideal solution. In the early 1990’s several companies introduced a cap for carboys that sealed the top of the carboy off but had two holes. One hole was carefully sized to match an average siphoning wand, and you actually blew/sucked air through the other hole to create a vacuum (or overpressure) that would initiate the transfer. This was a slight improvement over the old manual method of priming with water, but you ran the risk of introducing air (or germs) from your mouth into the beer. Again, not an ideal solution. Many brewing stores now have a device commonly called the “auto siphon” for sale. These are made from two tubes. The outer tube has a one way valve on it near the bottom and sits in the wort you are moving, and an inner tube has a seal that lets it act as a piston. The hose is attached to the inner tube. To operate it you pump the inner tube slowly which brings wort into the tubes on the upstroke, and forces it into your siphon tube on the downstroke. With just a few pumps you can get the siphon primed and the wort moving easily, so this seems to be the best of both worlds. However, I’ve had problems with the seal on several of these devices. If you have even a slightly poor seal between the inner and outer tube, that seal will let air in. Once the siphon gets going it can be even worse since the siphon acts under a vacuum – drawing in more air as it goes. This will show up as bubbling in the siphon – and can be a real problem as you certainly don’t want to contaminate your finished beer with air. A workaround is to add some sterile water to the outer tube outside of the gap – so if your seal leaks it will draw in sterile water instead of air. However, this takes us almost full circle back to the “old fashioned” method since I now need to prime my siphon with sterile water before starting, and also you need to worry about the water in the auto siphon as you pump it for priming. The other problem with siphons is that it can be hard to separate the wort from the trub. Earlier in my brewing career I obsessed with minimizing the amount of trub from the boiler and sediment in the fermenter. I used to attach cloth to the bottom of the siphon wands to try to filter out the sediment. Lately I’ve realized that if I’m careful with the wand when transferring, not that much really comes over. So I’ve given up my cheese-cloth filters and simply try to keep the siphon wand above the sediment as long as possible, and tip the vessel at the end to avoid sucking up too much trub. Also I try really hard not to disturb the sediment when transferring. So I’ve come to the end of my rant on siphons. Moving to a conical fermenter has helped, at least with fermentation transfers because I can separate the wort from the sediment before transferring, and also don’t need to use a siphon to transfer the wort. Today I still use the auto siphon if needed, but do add some sterile water first as insurance against leaks. Its not ideal, but I like the ease of use of the auto-siphon, and I’ve found a few of them that seal pretty well and don’t leak much. Do you have a better option for siphoning? Leave a comment below. Thanks for joining me on the BeerSmith Home Brewing Blog. Be sure to sign up for my newsletter or my podcast (also on itunes…and youtube…and streaming radio station) for more great tips on homebrewing. Also check out the How to Brew Video series I shot with John Palmer if you want to learn more about all grain brewing. When I siphon I use the cane-tubing setup. On my sink faucet I install a 1/2″ barb fitting. I sanitize the cane-tubing then fill them up with tap water by slipping the tubing over the 1/2″ barb. I know tap water is not sterile but I have never had contamination (that is tasteable). I then submerge the cane into the beer and discard the water until beer comes through. 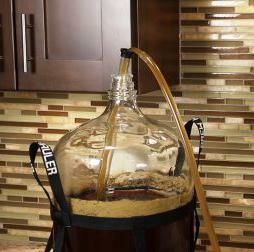 The beer coming through goes into the carboy – Cheers!! I hate the auto-siphon. That thing never worked well for me. It would end up losing prime partway through the siphon process largely due to the excess air leakage, and I’m sure it had the effect of causing oxidation for the same reason. 1) I use a 1/2″ stainless steel siphon. The 1/2″ inner diameter makes it MUCH faster than the 3/8″ plastic ones. Stainless steel makes it easier to clean. I can put it in the oven at 300 degrees if I want to sterilize it, and/or use more abrasive brushes inside of it than I could ever use with plastic since I can sterilize with heat. Finally, it’s much more durable. I went to the SS siphon because I had snapped too many of the 3/8″ plastic ones trying to get the tubing off of them. 2) Instead of sterile water to start the siphon, I use star-san. I let the star-san drain into a bucket (or the dishwasher, or garage floor) until I’m pulling wort, and then put the tubing end into the receiving vessel. I find that with the siphon tube (and my hands/etc) full and covered with star-san, I’m at less of a risk for contamination than just trying to sterilize water. Granted, these days I only use a siphon when I make wine or other things that use a carboy. With beer, I use a Sanke fermenter with a fermenter kit from Brewer’s Hardware (https://www.brewershardware.com/Sanke-Fermentor-Kits/). With this, I actually hook CO2 up to my blowoff tube and transfer under pressure. Much better in all ways than siphon with a carboy, and FAR less expensive than a conical. But I realize even this might be overkill for a lot of brewers, especially those who don’t keg and don’t have CO2 on hand. With a Siphon cap, plastic racking cane, tubing and a beer out ball lock connector I can now easily use CO2 pressure to move beer from my primary carboy to a ball lock keg without air every touching the beer. I use an empty ball lock keg as a secondary and keep it under pressure with CO2. From there I can use CO2 to move it to a “bright” keg, then ultimately to a service keg. The beauty of thus is that one in the primary (carboy), the beer never touches air until it comes out the tap. I’ve even built a keg to keg transfer tube using two beer out connectors, tubing and an in-line T that feeds a pony tap to draw off beer for hydrometer readings and beer tasting. Careful placement of the racking cane can facilitate or prevent the inclusion of settled yeast epending upon my need. I have 2 brew kettles that have spouts installed on them. My mashtun has a spout also. I use a 3 tier setup. My stove top, a chair and the floor…lol. I boil the strike water on the stove then drain it into the mashtun with the grains in it that’s sitting on the chair. I then refill the kettle with sparge water. Once I’m ready to sparge, I have a setup I made that is like a shower head over the mashtun. I just flow the water out of the kettle to the mashtun at the same rate, and let that go for 40 minutes or so. At this point, the kettle is on the stove, mashtun on the chair and wort collecting kettle pot is on the floor. Once all wort is collected, I put the kettle on the stove and boil. After that’s done, I drain the chilled wort to the carboy, or in my case a device called Vessi. So no siphoning for me, but no pumps or any of that either. I’ve been fighting with this problem too. I had several problems with auto siphons and gave up on them. I don’t like the idea of using sterilized water, since it’s more time boiling water, and I don’t want to dilute my beer if things don’t go well. With the siphon cap setup, you can add a filter to where you blow in, which helps, but I still don’t like the idea of blowing in oxygen. I guess you could carefully pipe in CO2 instead, just enough to get the siphon started, but I don’t have a CO2 tank yet. I’ve been using a basic racking cane and use a turkey baster on the end of the hose to get it started and then put the hose in the bottling bucket. If the turkey baster is large enough the the height differential large enough, it seems to work well. I use an oversize rubber stopper that I drilled a second hole in. My 1/2 in stainless tube goes through one hole. One line from my regulator ends in a valve with a male flared fitting. Holding the rubber stopper over the top of the carboy, I press the male fitting over/into the hole in the stopper and give a quick shot of CO2 until the siphon starts. I’ve always had good luck with the auto-siphon. It does take some careful handling and a watchful eye so that you a) don’t get any air bubbles and b) don’t end up pulling in too much trub/sediment. I am looking into conical fermenters now though, as I can see them being valuable in the transfer process. Most likely will end up with the Ss Brewtech Brew Bucket (have their Brew Kettle and it is a beautiful piece of equipment). I currently use the plastic Venturi vacuum device with garden hose fittings to start my siphon. I have a tee fitting in the siphon hose. Once the beer starts to flow towards the vacuum I clamp below the tee with hemastat to force the beer down the path to the secondary fermenter, bottling pot etc. Recently picked up two 10 gal corny keg aka fermenters on eBay so co2 gas transfers are probably also a future option. I’ve never had good results with the autosyphon. I wrote my first on off as user error and product quality issues (poor priming, leaks, etc). I bought a second, “better quality” syphon but had similar issues. I upgraded my kettle (ball valve) and bought an Anvil SS fermenter with concave bottom and ball valve. No more autosyphon, less transfers. Best investment to date.